As a world’s leading cryptocurrency trading platform, Bithumb has been committed to providing users with safer and more efficient transaction services, meanwhile, it is actively developing blockchain ecosystem as well, in which the decentralized exchange plays an important role. After comparing several decentralized exchanges and transaction protocols, Bithumb chose to bring 5 million users to access R1 protocol. 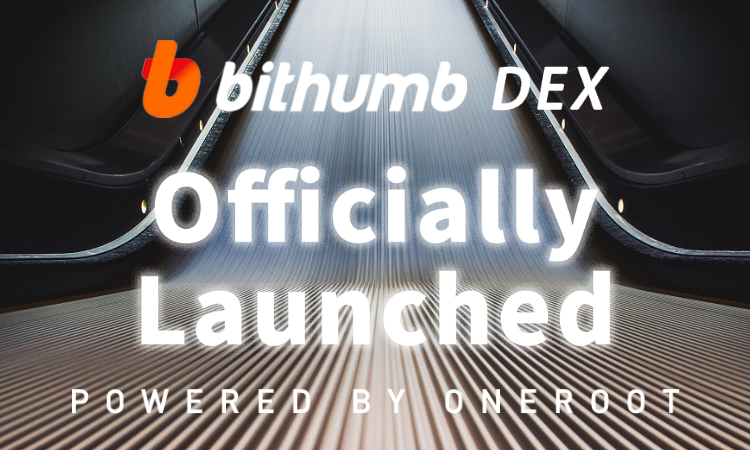 On October 15, the Ethereum — based efficient Distributed DEX, which is jointly built by Bithumb and ONEROOT, is officially launched, with R1 protocol developed by ONEROOT as the core part. In comparison with centralized exchanges, DEX’s assets are stored in smart contracts and independently controlled by users. Even if the exchange is attacked, there’s no risk of asset loss, which greatly improved security. All transaction histories are recorded on the blockchain, with corresponding transaction details and cost deduction open and transparent, which fundamentally eliminates covert operations. As an efficient decentralized Token exchange protocol, R1 protocol innovatively separates matching and settlement of orders, enabling order matching to be done off the chain. As a result, there’s a significant increase in transaction speed and Bithumb users can enjoy trading experiences comparable with those of centralized exchanges. Bithumb DEX shares order data and liquidity with all R1-based exchanges, providing users with better trading depth and higher asset liquidity. The sharing of order data and liquidity is the most important feature of R1 protocol, which embodies the concept of sharing and win-win which is consistently upheld by ONEROOT. With R1 protocol as core, different exchanges can carry out cross-regional cooperation, which was defined by ONEROOT team as DDEX (Distributed Decentralized Exchange). This trading system is significant for the overall ecosystem of Bithumb, and contributes to the establishment of global distributed business system. At the same time, the access of Bithumb DEX, which holds a large volume of global traffic, will undoubtedly promote the explosive growth of ONEROOT ecosystem, and both sides will continue to benefit from this cooperation. After this model is truly understood by the market., and the snowball effect is generated, the development of the industry will be greatly promoted to build a win-win ecosystem and open the era of free trade. The bear market will last long, while ONEROOT team will uphold the beginner’s mind and strive to move forward. In the next step, ONEROOT will carry out deep-level cooperation with more partners worldwide on the strength of Rocket Plan, putting the beginner’s mind — consensus, co-found, sharing and win-win — into practice. We will create a bright future of trading freedom with technology as the keel and traffic as the engine. ONEROOT is the world’s first blockchain project to propose the concept of traffic sharing. With R1 protocol as the model, ONEROOT supports operators that hold user traffic to quickly build their own decentralized exchanges and truly enjoy the freedom of trading. Meanwhile, all R1 protocol-based exchanges are able to share transaction data and liquidity, achieve win-win ecosystem, as well as build a solid underlying infrastructure of the entire industry.